When someone calls Lake Wylie “The River” you know they are a native to Rock Hill, South Carolina or they have lived here for many years. The Catawba River, which is named after the Native American tribes who were the first settlers on its western North Carolina banks, has it’s beginnings in the Appalachian Mountains and ultimately drains into the Piedmont some 200 miles later. Early in the 1900’s a reservoir, located between North Carolina and South Carolina, was created from the Catawba River for flood control and to build a hydroelectric plant which we know now as the Duke Power Company. The man-made body of water created by the damn near India Hook Road in Rock Hill, was officially named Lake Wylie in the early 1960’s, but to the locals, even decades later, it’s still known as The River. Being close to Lake Wylie was a primary factor for our family when we moved to Rock Hill in the mid-1980‘s from Texas. We had a boat and loved to water ski and just ‘hang out’ on the water with the kids whenever we could. We first looked at homes we focused on Tega Cay, one of the few communities that had direct lake access at the time, but we couldn’t find a home that fit our budget and our needs at the time. We ended up purchasing a house in the northern part of Rock Hill, not far from Ebenezer Landing, a public access to Lake Wylie. As our children grew, we spent countless hours on Lake Wylie with our 18 foot runabout boat. We all enjoyed water skiing, and hanging out on the infamous Little Allison sand bar that could have been the inspiration for the song Redneck Yacht Club sang by Country Music artist, Craig Morgan. 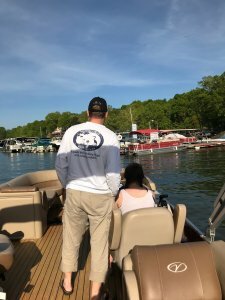 It had been years since my husband and I had been on Lake Wylie, but last week our daughter rented a pontoon boat from the Tega Cay Marina as a birthday surprise for her brother. 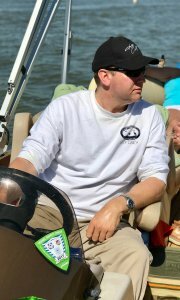 We packed up our Yeti’s with soda, water and a couple of beers and we took a boat ride with some of his closest friends around Lake Wylie. It was a trip down memory lane for all of us on the pontoon boat, seeing how the little shacks and shanties that once dotted the shore line have sprung up to be what I consider to be mini-mansions. Most of the familiar landmarks from 20 years ago had changed so drastically we hardly recognized Little Allison and Big Allison coves. We did recognize Bowater Park, Goat Island, and of course the sandbar where we played in the water. Even Ebenezer Park had drastically changed, now offering picnic shelters, a swim area, camping and public bathrooms. The birthday surprise was a hit. The day was delightful. The weather was perfect. We had lunch at the iconic T-Bones Restaurant, located near Buster Boyd Bridge and cruised around Lake Wylie the entire day reminiscing about all those warm summer days and nights at The River.